Scope: Which articles are to have a promotion text 5? You are to add promotion text 5 only to main articles, not to accessories such as moulded legs and bolts. 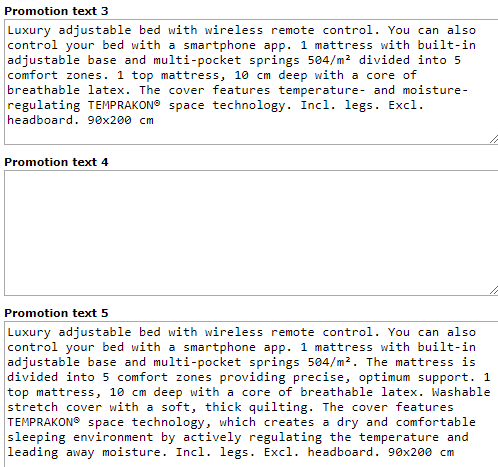 Please note that we have master promotion texts for selected articles, including mattress accessories, which are indeed to have a promotion text 5. In case one of these selected articles is to have an online text, you will receive special info from the text team in Marketing. Examples are mattress underlays and wedges. The promotion text makes it easier for our customers to understand the use and benefits of these articles. As a rule, articles outside the scope described above are not to have a promotion text 5. Reason: In many cases, the promotion text would be very similar to article info in the online sales text resulting in superfluous duplicate content. However, there is room for exceptions if an online promotion text makes it easier for our customers to understand the use and benefits of the article. An example is ALSTEN roller blind. The blind has special features, which are not described in the online sales text. Therefore, it is okay to add a promotion text 5, as JDK has done. If the article only has a short text (promotion text 3), you copy this text to promotion text 5. If the article has both a short text (promotion text 3) and a long text (promotion text 4), you copy promotion text 4 to promotion text 5. For mattresses, duvets and pillows, you need to add promotion text 5 for all sizes and adjust info about size, filling weight, number of mattresses and other relevant info. A good place to start when you are going to add promotion text 5 to an article is to look up similar existing articles. Then you can see what you have done before. On MYJYSKdocs for Sales and Expansion, you can find a best practice document describing in more detail how to continuously ensure that all relevant articles have a promotion text 5. Promotion texts in campaign papers are to serve as "appetisers" designed to make customers want to continue their journey in a store or online. The texts are to be kept as short as possible. Promotion texts on the website are to include more info about relevant features without going into detail. The longer texts will help our customers understand the often complex article features. Also, the texts will appeal to search engines and help attract potential customers to our websites. The consequence of the new distinction between our promotion texts is that the short text (promotion text 3) is the only text you can use in your campaign paper. The long text can only be used on our website. Promotion text 5 is not transferred to Manus. So when working in Manus, you will not have to remember that the text is not to be used in the paper. It is easy to identify rewritten master texts targeted at our website.